Home Costs > How Much Does Refacing a Fireplace Cost? How Much Does Refacing a Fireplace Cost? Refacing a fireplace is a procedure where the front side of a fireplace is remodeled to add a new layer of design around it. Refacing or remodeling a fireplace involves several steps depending on the type of materials that will be used for the project. Refacing can not only help maintain the look of a fireplace, but it can also make it look a lot better than what it was before. The price for refacing a fireplace depends on how large the fireplace is, the complexity of the design, how much tearout is required, the materials that will be used to remodel it and contractor performing the job. How much does it cost to remodel a fireplace? On average, refacing a fireplace can cost anywhere from as little as $200 if you were to do it yourself to as much as $4,200 installed. This price range can go significantly higher if a customized design is desired or if the fireplace is larger than average. For example, if you were to use in-stock materials, plan on spending about $10 to $15 per square foot to hire a professional such as a mason to install an artificial stone; however, if you were to need customized materials, then costs could skyrocket to more than $25 per square foot to reface a fireplace with stone, especially if you were using real stone. Stacked or full-depth stone could be closer to $50 to $80 per square foot. For a refacing kit that can be completed by the homeowner without any professional help can cost anywhere from $200 to $1,700. For instance, on this House Logic post, they showcased four fireplace refacing projects that ranged anywhere from $150 to $880. The cheaper job, which cost about $150 for the materials, simply involved painting the brick and replacing the worn-out wood, while the $880 job involved adding shingles and wood shims to the wall and re-facing the fireplace with new stone, mortar and wire mesh. Before the job starts, the contractor will help you pick out materials that they can use to replace the current fireplace and/or show you past jobs to help you decide what you want. You can also refer to the Internet to find previous refacing jobs done by other homeowners. 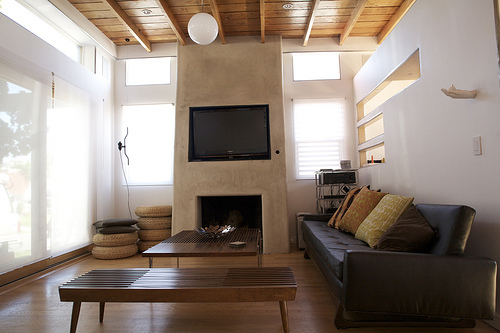 For instance, this Houzz page has hundreds of ideas. Contractors can commonly replace older fireplaces with tile, painted bricks, etc. The fireplace can also receive additions such as mantels and new doors. During the procedure, the surface will be prepared, and during this preparation process, the entire surface will be cleaned of any dents or scratches and the previous materials will be removed. Afterward, the fireplace will either be painted or the fireplace will be completely resurfaced with new materials such as brick, veneer or whichever material you decide to choose. If the fireplace is resurfaced, it can have material such as stucco applied, with a mantel installed after the procedure has been completed at 100%. Fireplace doors that can enhance the appearance of the fireplace will not usually be included in the refacing and will, therefore, be an additional cost. These doors can start at $500 depending on the size, design and make. According to this answer on Angie’s List, if your new fireplace can’t hold the new weight, then you may have to “beef” up your foundation to be able to support it. If this were the case, then this could add another few thousand to your cost. Consider doing the job on your own, and check and compare prices between different stores that sell refacing kits. Some kits can be as little as a few hundred dollars and will come with simple step-by-step instructions. If you want to hire a contractor, consider getting multiple quotes for free from HomeAdvisor.com. Here, you simply explain your job and contractors will reach out to you with a ballpark estimate for free. Most contractors will be more than happy to provide a free in-home consultation and quote on what they can do in your specific situation. Consider cheaper alternatives such as painting the fireplace rather than refacing it with tile or stone. Even if hiring a contractor to paint the fireplace, this entire process can cost less than $500.